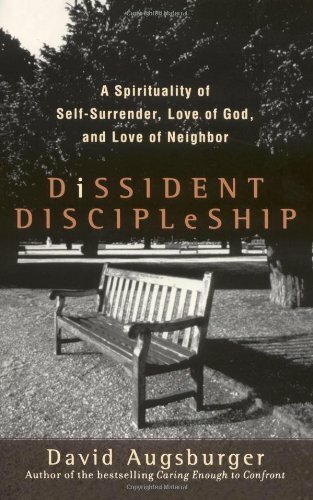 The second practice Augsburger brings us to in Dissident Discipleship is what he calls Stubborn Loyalty. Stubborn Loyalty “to the community of the Spirit is joining the circle around Jesus as the primary social location where we learn to act toward all others as, in reality, we act toward Jesus” (p57). The church encounters Christ in community. The church only truly, fully exists when it exists in community (there’s some Dietrich Bonhoeffer for you). Augsburger’s emphasis is upon the unity that only exists within the community of faith. The call is to encounter Christ within the God designed communal nature of the church. Throughout the text, Augsburger intrinsically balances our commitment level, compelling the believer to consciously acknowledge that it is Christ who unifies. Not just loyalty, but stubborn loyalty. Commitment. Resolution. Is what God desires/requires…. Our Stubborn Loyalty is to Christ and to His Kingdom. The church is defined by Christ. As we engage in authentic Christianity and discipleship, the community of faith that we are formed into is designed in such a way that we are continually called beyond ourself and to fidelity in Christ. Relationship with God and with others culminates in the spiritual reality of being an integral part of the Christian community that God has made possible through the Gospel message. Stubborn Loyalty to God, Christ, His Kingdom, and to the purposes He has called us to in Jesus. How delighted I am that you faithfully grow in the Lord! I love you, my precious son, my brother in Christ. I am proud of you and your love for Him. Thank you for your encouragement and edification to others to the glory of our Lord and His kingdom. Blessed be the name of the Lord. He has blessed me with a loving son! Encouraged by my mother-in-law this morning! How cool is that….